For 1100 years, Kyoto was the capital city of Japan. It was here that sacred rituals, and traditions such as the tea ceremony, continued to be passed down over many generations, and it is here in Kyoto, where so much of the culture that Japan is proud of, continues to exist today. One of these is no doubt, kemari. Said to have originated in China, it was brought to Japan along with many other cultures, including Buddhism, about 1400 years ago. Although it fell into disfavour in its country of origin, it became widely practiced and developed independently in Japan. Kamari is a group activity where 8 people stand in a circle and kick the mari, a ball which is made from deerskin, to each other. It has been widely loved by people since the Heian period, from successive emperors to nobles alike. Resembling present-day football, it was enjoyed by many people in places around the city that came to be known as kemari courts during the Edo period, including the places such as Maruyama Park and Shinkyogoku. Since ancient times, kemari has never been a competitive sport with a winner or loser, instead it has always been about the beauty of passing and controlling a ball as it moves from person to person. Late into the Heian period, a master of kemari appeared, Narimichi Fujiwara, who is said to have perfected the beauty of the pass. We created Total Purple as a brand to celebrate football culture. 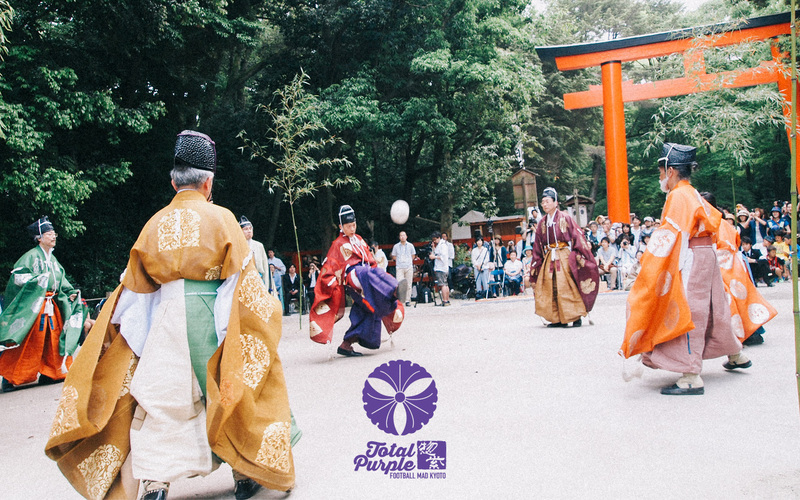 It has been designed with the special kit in mind that was bestowed upon kemari masters by the kemari head family, a purple hakama. Total Purple is an independent and original football culture brand, not to be found in England, Brazil, or elsewhere. It is a football culture brand created for football mad Kyoto.